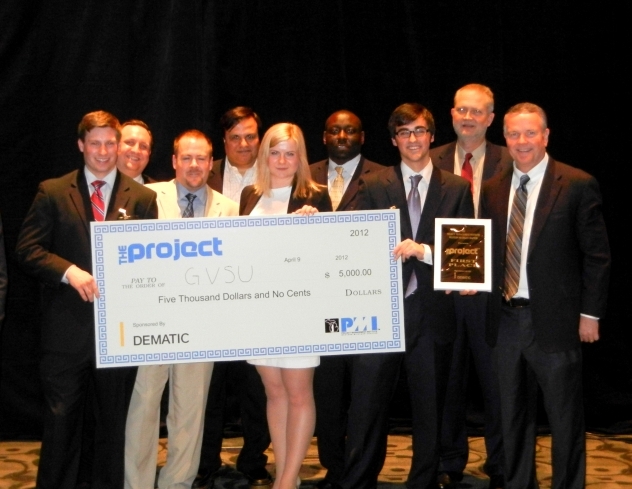 The recent THEProject 2012 WMPMI Collegiate Competition was the first in PMI’s history! As a volunteer during the one-year planning process and as a newly elected Director of Public Relations at the Western Michigan Project Management Institute, I spent April 9, 2012 at the special one-day finale. Develop business leaders by partnering with college students, community leaders, and Project Management Professionals to competitively tackle a commonly shared business challenge. As a volunteer, I personally feel our chapter was trying to help individuals realize the importance of project management not only for businesses, but as a career choice. Everyone who served on our committee entered project management as an accidental career choice, not as part of our career path. What Did They Have to Do? Students had to research what would be involved for a company to be certified by B Labs as a B Corporation. In this process, they had to produce artifacts that would meet project management standards and business executive standards. As luck would have it, the project picked for the students is currently being considered by the State of Michigan as a new form of corporation. The website for THEProject 2012 contains more details about the project including the deliverables and a video of the project selected for competition. Personally, I was surprised at how skilled and well prepared students were during the final presentations. Judges presented difficult business questions such as “Can you cut the price in ½?” or “What competitive advantage does this project give us?” Students were extremely persuasive in explaining why the executives should choose to move forward and some student teams got real companies to participate during THEProject. One of the many “executive presentations” to help students earn points towards the grand prize. Pictured here is a Team B from Kalamazoo College. The WMPMI dinner was more of a social time for students and members to meet while the final scores were tallied. The winning teams (Grand Valley University, Michigan Tech Team B, and University of Phoenix) shared $10,000 in prize money. Grand Valley University took first place. The winners from left to right: Matt McNamara (GVSU team), Joshua A. Gerlick (co-Champion), Steven Williams (GVSU team), Dr. Jaideep Motwani (co-Champion), Iwona Gruszka (GVSU team), Benjamin Todd (Mentor, Amway), Eric Baumgarten (GVSU team), Ted Kallman (Project Exec. ), and Jeff Moss (Dematic Exec.). Photo via the Western Michigan chapter of PMI. Closing remarks - Fred Keller, one of the judges who said PM DRIVES companies and this was a great learning opportunity for all (including himself). PMI members, you can learn more about this inaugural event in a video to be presented at PMI Global Congress – EMEA and in the July issue of PM Network magazine. Shorter video, recommended for the General Public. [iframe width=”546″ height=”307″ src=”http://www.youtube.com/embed/A_ReOiwNHRE” frameborder=”0″ allowfullscreen] Watch the video on THEProject 2012 website. Longer video, recommended for other PMI Chapters. [iframe width=”546″ height=”307″ src=”http://www.youtube.com/embed/dXF5Rivboio” frameborder=”0″ allowfullscreen] Watch the video on YouTube. College students are coming prepared to be project team members and apply project management principles to business projects. If your organization wants to improve PM skills, Advisicon can help. Cindy, nice coverage on THE Project. We certainly had a terrific program with a terrific outcome. After discussions with the students who participated, it appears that we met our mission! I was very impressed with the participation of the judges as the time they devoted was above and beyond. Our chapter’s mission is to promote the value of project management in our area and this project did just that. WMPMI plans to continue the focus on these type of initiatives in the future. I think that in-depth competitions like these are great ways to test students’ abilities and push them to excel. Thanks for taking time to read the article and give us your thoughts. That is great! I love all the references to the story that were inleudcd and the song was a perfect fit! I’d love to see the guidelines/rubric you gave them that you used to evaluate their projects. Thanks for your comments. Due to a detailed, multi-stage, lessons learned engagement; the guidelines/scoring/metrics are being redesigned for 2013. In the second year of the contest the local chapter and PMI Global are working to determine the best way to share more details of the contest with others who might be interested but were not students or sponsors of TheProject. This is still in the works, but look for further details on http://www.wmpmi.org and review TheProject2013.